Join the Band is an approved vendor for many home school programs. Guitar, Piano, Keyboards, Drums, Percussion, Bass Guitar, Voice, Ukulele. Our teachers are university trained and well versed in creating a music lesson plan to fit your needs. Rock, Blues, Jazz, Classical, Funk, R&B, Reggae, Heavy Metal and more! *Early weekday times are available by request. Band group classes meet weekdays after school, and Saturdays. *Yearly registration fee of $39 covers all programs starting with the September school year. Note: All lesson and band tuition fees are paid monthly. Lesson counseling and evaluations with our staff. Weekly lessons with our qualified Join the Band music teachers. All JTB teachers are University trained music professionals. Music lesson tuition is applied monthly based on how many days your lesson falls per month and minus any JTB school holidays. Monthly tuition is based on an average of four lessons per month. (1/2 hour lessons are $168 per month) If there are five lesson days in a month the monthly fee is five times the per lesson fee ($210) Some months may only have three lesson days ($126). Please note: In case you have to miss a lesson, your teacher will record a video lesson for you via LessonMate. 2 month commitment for private lessons. Band is only $279 per month. Bands rehearse 2-3 songs (60min rehearsals) depending on playing level of songs and students. Additional tuition and rehearsal time (90min rehearsals)for bands that opt for 4- 5 song band. Use of all stage equipment for rehearsals and concerts. Professionally prepared music charts for your band class. Qualified JTB Band Leader to lead your rehearsals. 3 school year concerts and 1 summer concert. Participation in our community event and school concerts. Laminate stage pass and concert program. Band Member counseling and evaluations. Private lessons and our popular “Join the Band” band program. Band is only $259 per month. *Plus your monthly lesson fees. (Band is normally $279 without lessons. See Package 2 above. Note: Lesson tuition varies from month to month depending on whether your lesson day meets 3, 4, or 5 times in any given month. BENEFITS OF THE :JOIN THE BAND” BAND AND LESSONS PROGRAM. 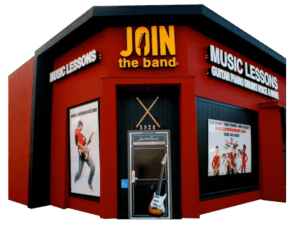 Private lessons program benefits (1), plus the “Join the Band” band program. * 30 day notice to withdraw from lesson or band program.